This comprehensive 8 Volume course contains a complete method of learning how to play pick style acoustic guitar. Each volume provides step-by-step instruction covering everything from fundamentals to highly complex techniques. Whether you are a beginner or an advanced flatpicker, "Flatpicking Essentials" will help you to push your playing to the next level. Each volume comes with a CD so you can hear how a style or technique is played. We also offer the course in a digital format. The foundation of the course is based on the proven learning method developed by Dan Miller and Tim May who collectively have over 40 years experience of teaching and professionally playing acoustic string instruments. "Flatpicking Essentials" differs from other teaching methods because it teaches you not only how to play, but also how to learn so that you are able to fully master new concepts and techniques. "Flatpicking Essentials" was one of the few pick style books to be awarded a spot in "The 50 Greatest Guitar Books" by Shawn Persinger. 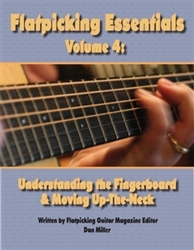 To Order any of the Flatpicking Essentials titles, or any of the Supplemental books, click on the title or book image below. This 96-page spiral bound instructional book, with audio CD, teaches you how to play interesting and exciting rhythm guitar accompaniment by showing you how to fill the rhythm guitarist roles of: Keeping Good Time, Outlining the Chord, Leading the Listener's Ear to the Chord Change, and adding Texture, Excitement, Drive, and Interest. The goal of this book and accompanying CD is to make you a better rhythm player and improve your knowledge of bass runs, fill licks, and right hand strumming patterns. 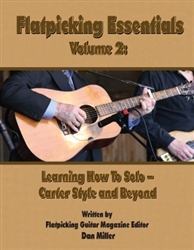 In the 108-pages of Volume 2 of the Flatpicking Essentials series you will be given very detailed instruction designed to teach you how to create solos to vocal tunes by using the following process: 1) Select a Vocal Song 2) Learn the Chord Progression by Ear 3) Learn the Basic Melody by Ear 4) Find the Carter Style Arrangement 5) Embellish the Carter Style Arrangement using techniques such as hammer-ons, pull-offs, slides, alternate chord strums, tremolo, double stops, crosspicking, neighboring notes, scale runs, drones, and fill licks. If you've ever sat and watched a professional player's fingers dance up and down the fingerboard with great ease and thought "I wish I could do that! ", this book and 2 CD set are for you! This volume teaches you how to use the entire fingerboard and gives you practical exercises and song examples that will help you become very comfortable playing up-the-neck. You will learn to explore the whole guitar neck using a very thorough study of three important fingerboard familiarization "road maps," including: chord shapes (chord "centers"), scale patterns (both horizontal and vertical), arpeggios, and song examples. You will also learn how to comfortably move up-the-neck and back down using slides, open strings, scale runs, harmonized scales, floating licks, and more. Improvisation is something that flatpickers always ask about at workshops and seminars. It is one of those mysterious and elusive concepts that is hard for many people to grasp. 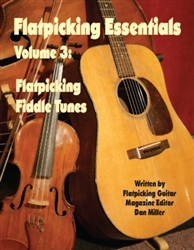 In this Volume of the Flatpicking Essentials series authors Dan Miller and Tim May take away the mystery by presenting a step-by-step gradual learning method that will have you improvising immediately and then build your skill slowly and steadily. By the end of this book you will have the confidence and the skill to step out and start improvising at your next jam session. In addition this book includes "Style Studies" that are focused on the "founding fathers" of flatpicking: Doc Watson, Norman Blake, Clarence White, Tony Rice, and Dan Crary. 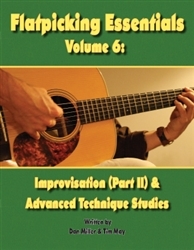 Volume 6: Improvsation (Part II) & Advance Technique Studies This book provides you with 152 pages (and 2 audio CDs) worth of valuable information that is designed to help you take your flatpicking to the next level. The first section is Part II of our study of improvisation. An added feature of this Volume is an appendix that will serve as an easy reference for all of the chord progressions from Volumes 5 and 6. We also provide slow, medium, and fast back up tracks for all of these progressions. 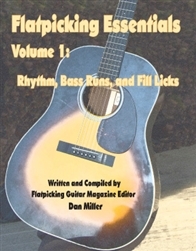 The second section of this book is focused on advanced flatpicking technique. We approached this topic by having Tim May record "advanced level" improvisations for nineteen different flatpicking tunes using a list of techniques, like the use of triplets, natural and false harmonics, note bending, quoting, alternate tuning, syncopation, twin guitar, minor key tunes, hybrid picking, advanced crosspicking, string skipping, etc. 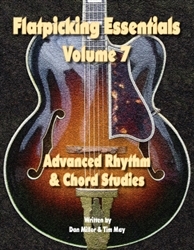 Flatpicking Essentials, Volume 7 is a 170 page book, with 67 audio tracks, that will show you how to add texture, variety, and movement to your rhythm accompaniment in the context of playing bluegrass, fiddle tune music, folk music, acoustic rock, Western swing, big band swing, and jazz. The best part of this book is that it doesn't just present you with arrangements to memorize. It teaches you how you can create and execute your own accompaniment arrangements in a variety of musical styles. 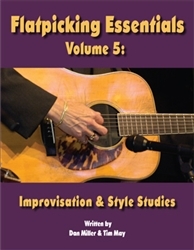 The eighth and final book in the Flatpicking Essentials series teaches you how to begin to play swing and jazz tunes in the context of a flatpick jam, including how to learn to improvise over swing and jazz chord changes. 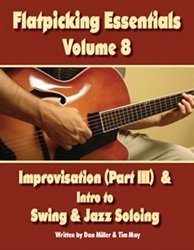 After presenting how to study and utilize scales and arpeggios in the context of using them as "road maps" for improvisation, and providing examples of how to build from a simple song melody to a jazz style arrangement, this book presents three variations of ten standard swing and jazz tunes. You will learn the basic melody, plus two arrangements of each tune by Tim May. The tunes presented include: Avalon, Bill Bailey, 12th Street Rag, The Sheik of Araby, Rose Room, After You've Gone, St. James Infirmary, St. Louis Blues, Limehouse Blues, and I Ain't Got Nobody. Scales and Arpeggios form the foundation of all song melodies, arranged solos, licks, phrases, and improvisations on the guitar. If you are familiar with scales and arpeggios, and know how to use them, your ability to arrange and improvise your own solos will be greatly enhanced. Scale knowledge is the road map that can take you anywhere you want to go in music. This 160 page book (with 136 audio tracks on 2 CDs) by Dan Miller and Tim May not only teaches you how to learn scales in a way that is easy, fun, interesting, and informative, it also shows you how to practically apply scales when learning new melodies, embellishing those melodies to create your own solos and variations, and in exploring improvisations. In this new 260-page book Flatpicking Guitar Magazine editor Dan Miller presents three different approaches to learning how to develop creative, interesting, and tasteful melody-based solos on the acoustic guitar—the technique approach, the theoretical approach and the intuitive approach. After outlining the process of finding key, chords, and melody on the guitar by ear, the first approach to developing a solo uses a variety of guitar techniques to embellish and add to the melody. The second approach teaches you to develop your solos based on a variety of scales and music theory. The third approach provides you with exercises to help you access your creative and insightful right brain in an intuitive way. Each technique is taught using many song examples.